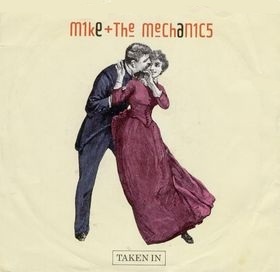 Desert Island Singles: “Taken In” by Mike and The Mechanics (1985) | Name-Brand Ketchup. ← Strawberry Limeade. NOM NOM NOM. Mike and The Mechanics are an all-star band brought together in the mid-80s as a side project by Genesis guitarist Mike Rutherford. In its heyday the band featured lead vocalists Paul Young and Paul Carrack in the same lineup, two of the best “journeyman” vocalists since Tony Burrows and Ron Dante. The album notes credit saxophone players Ray Beavis and John Earle. I’m not sure which one takes the solo on this song, but his interplay with keyboardist Adrian Lee is masterful. Look for former standup comic and, later, TV cop Richard Belzer in the video. 1) Having made the Burrows/Carrack comparison many times myself, only to receive blank stares, your reference brought me validation and joy.